TCC IS A TELECOMMUNICATIONS COMPANY IN WEST CENTRAL WISCONSIN OFFERING INTERNET, CABLE TV, AND PHONE SERVICE IN A RURAL AREA. WE ARE "GIG CERTIFIED" AND WERE DESIGNATED A "SMART RURAL COMMUNITY"
SCROLL DOWN AND READ OUR COMPANY HISTORY TIMELINE! TCC is a telecommunications company in West Central Wisconsin offering Internet, Cable TV, and Phone services in a rural area. We are “Gig Certified” and were designated a “Smart Rural Community” by the NTCA — The Rural Broadband Association. Here is our serving area. Click/touch map for larger view. Tri-County Telephone Cooperative was formed to provide telephone service to Eleva, Independence, Pigeon Falls, Pleasantville, and Northfield. On March 1, 1966, 180 subscribers in our Northfield Exchange started to use their new one-party dial service. This is the first all one-party system in the State of Wisconsin and one of very few in the nation! Western Wisconsin Communications Cooperative began as the nation’s first (and still only) Cable Television cooperative. Towns served by WWCC included Eleva, Strum, Osseo, Fairchild, Alma Center, Humbird, Merrillan, Whitehall, Independence, Arcadia, Trempealeau, Galesville, Ettrick, and Blair. Invested in the cellular interests in our serving area, which at the time was Cellulink. Over the years, this investment has paid off many times over in fees and royalties from cellular companies whose customers utilize our towers and network. Young couple stand together in field of green grass, with blue sky, fluffy white clouds and a few trees. This is the uncropped version of file 509754. Tri-County Telephone Cooperative and Western Wisconsin Communications Cooperative formed a new company together: Tri-West Communications, LLC, to provide Internet service over telephone and cable tv lines. 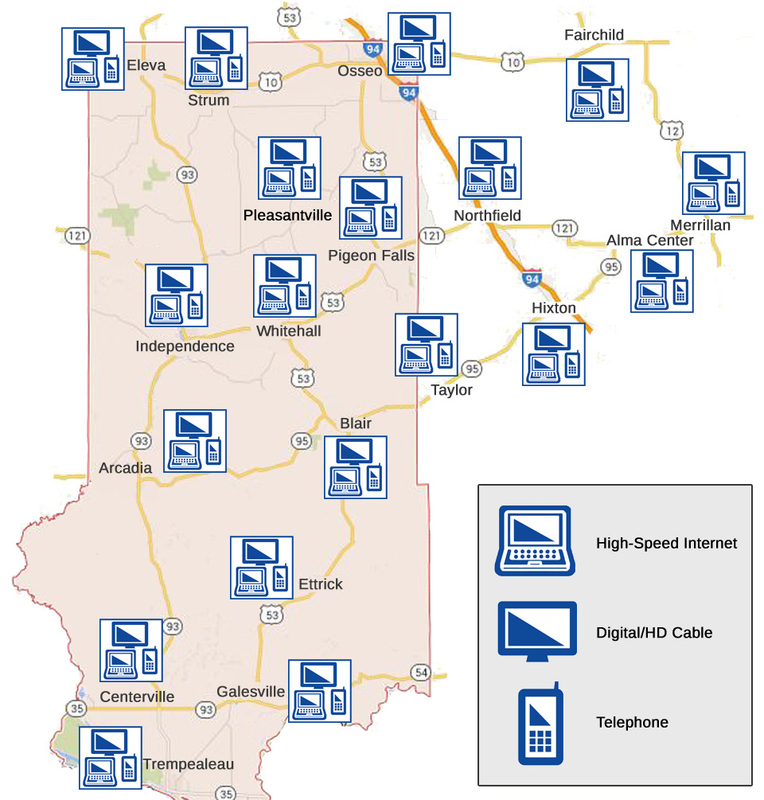 Tri-West Communications joined with 19 other companies around Western Wisconsin also providing Internet to collectively offer together what we might not be able to each provide individually. From this partnership, the company Airstream Communications, was formed. 100% DSL access in all six telephone exchanges. We were one of very few telephone companies with Internet service in Wisconsin offering DSL access to 100% of our access lines. Without additional equipment and electronics, DSL is distance-limited in its reach from the phone office. In true cooperative spirit, we wanted to offer access to the same service to all of our customers, regardless of distance from our phone offices. Tri-County Telephone and WWCC, after years of working together, officially merged to become Tri-County Communications Cooperative (“TCC”). A single, merged company could be more efficient and function as a team than two companies just “working together”. TCC began offering free technology classes in the community. Since then, TCC has offered over 100 classes with total attendance over 1,000! We adopted the name “TCC-U” for “TCC University.” Topics have included Windows Basics, Computer Basics, Facebook, eBay, Wi-Fi, Digital Pictures, Digital Music, Using a DVR, iPad Basics, Kindle Fire Basics, Internet Security, and Netflix. Started “Fiber-To-The-Home”project of installing and connecting “fiber optic” lines to all homes in our phone exchanges. Fiber optic lines send data as light pulsing through tiny glass tubes. Fiber carries more data at faster speeds (by far) than existing technologies, allowing us to have better capacity for services and Internet speeds both now and for the future. Fiber also eliminates our need to provide and maintain separate lines for phone and cable tv services to the same location. Smart Rural Community Award. Our company and our serving area was designated a Smart Rural Community by NTCA – The Rural Broadband Association, for our recent and ongoing efforts to improve the data network and overall technology culture in our area. This designation is an affirmation by a national organization and by our peers in the telecommunications industry of our efforts to improve the network and technology in the areas we serve. For our communities, it is a “badge of distinction” among other communities of having a solid network for fast internet, cable tv and telephone services. TCC was “GIG Certified” by NTCA – The Rural Broadband Association. This means our network was tested and was certified capable of speeds up to 1 Gigabit per second (Gbps). One Gigabit per second is 1,000 times faster than 1 Megabit per second. Being “GIG Certified” sets us apart from other providers who cannot offer speeds like this. It also sets our communities apart from other communities that do not have a provider capable of speeds up to 1 Gbps, which may help attract people and businesses to our area. TCC launched “TECH HOME” services for Internet customers in an effort to help protect customer devices and data. TECH HOME includes three services: SecureIT Anti-Virus, File Hopper Cloud Backup, and Password Genie Password Manager. TECH HOME has three packages: Protect — all 3 services for 1 PC + 1 mobile (included with TCC Internet); Protect Plus — all three services for 4 total devices ($9.95/month); and Support — all three services for 4 total devices plus Premium Technical Support ($14.95/month). Details and other information can be found at: http://www.tcctechhome.com.